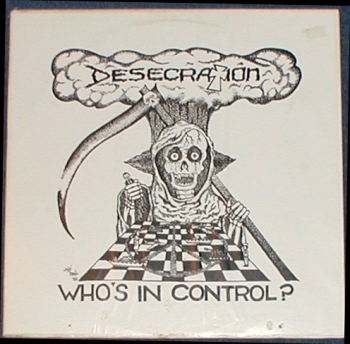 A 12" this time, although more commonly known as a 7" the Desecration - Who's in Control? 12"
This seems pretty much forgotten these days. The 7" with the same title (ltd. to 1000 with free live flexi) seems to pop up often enough but the 12", which is a different record altogether, has just about disappeared. It's a shame because this is certainly worth having. For sheer power the only band that comes close for the time is Infest. 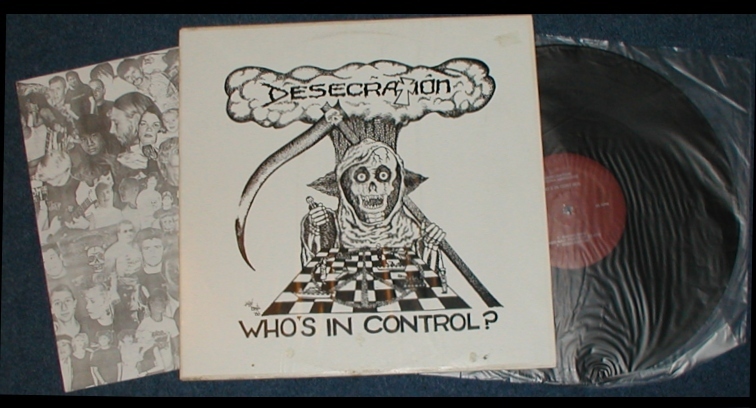 Like the Infest 12" this is a powerful and well produced record. Like that 1st Accused 12" this one also never turns up. Sleeve is a plain white sleeve with the images pasted by hand onto the front and back. This kept costs down and allowed the band to sell the record at an acceptable low price. 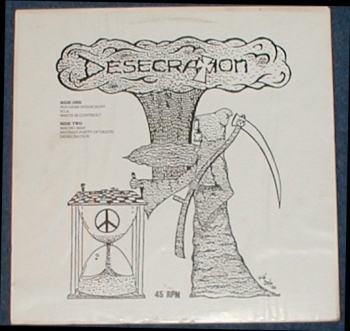 The band were encouraged by the production studio to press this up as a 12" as opposed to a 7". As a result the production really stands out. * Normally I wouldn't quote Pushead because he does tend to ramble on, plus his artwork is really tired, but this is one of the few mentions I could find of record on the internet.